Well, not quite the Route of the Caliphate*, but a great cross country route non-the less. After a great day and night in Cordoba, Conor drove us to Baena for the start of the next leg back to Los Tolmos. The intention was to overnight in Cazorla, and it was just a little too far for comfort to do the journey from Cordoba to Cazorla in a day. Baena is the bete noir of my cycling trips, having spent a night behind a wall there, in the rain, with dogs barking, and a broken bike… I wanted to revisit in the day light, and replace the old memories with some spangly new ones. 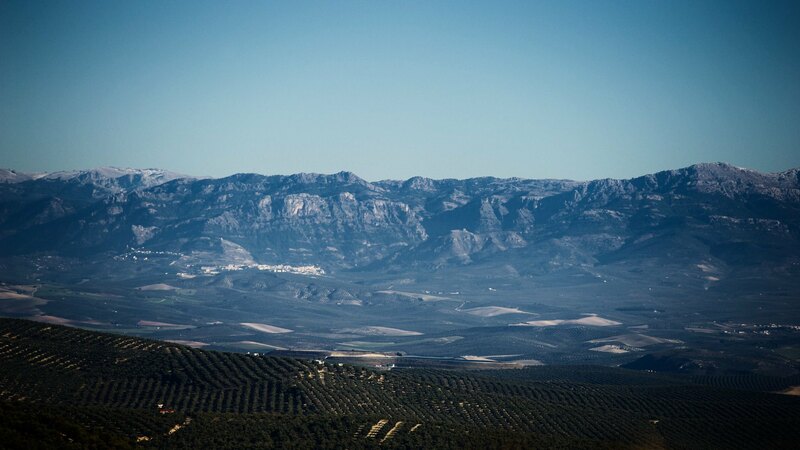 A direct west-east route from Baena to Cazorla takes you along the ridges of the Sierra Morena through the never-ending landscapes of Olive groves. The route takes you through the back roads and single lanes of Andalucian agriculture. The morning silence broken by the scurrying of some animal in the undergrowth, the distant baseline of a John Deere, the occasional moped laden with rickety crates strapped to it by bailing twine, ridden by a 300 year old man! The routes is transitional, never taxing, good tempo speeds, the occasional climb. Tranquil, aimless, contemplative country. The descent to Jáen provides a great view of the Cathedral, and looming in the hazy distance, the blue hues of the Cazorla mountains. From Jáen the route winds and curves its way easterly through the heat hazes across perfect cycling roads, smooth grippy asphalt, wide cambered sweeping curves, short rises and falls. Flicking the shifters is subliminal, the cadence natural and easy, the body soaks the endorphins like bread soaking up the rich olive oil. The rising limestone cliffs of the Cazorlas loom over the groves, protecting the mountainous Eden that lies beyond. The heat of the day was easing, the quads starting to tire. The bright highlights of La Iruela contrasting with the earth tones of olive greens, terracotta clays and slate blues and grays of the mountains. The ancient fort of the "Castillo de las Cinco Esquinas" starts to morph out of the pastel background as the road approaches Cazorla, its white walled casitas huddled together in the shadow of the cliffs like sheep in a corral.